The present invention is directed to a hemostatic wound dressing that utilizes a fibrous, fabric substrate made from a biocompatible polymer and containing a first wound-contacting surface and a second surface opposing the first surface, the fabric having flexibility, strength and porosity effective for use as a hemostat; and further having a porous, polymeric matrix distributed at least on the first surface and through the fabric, the porous, polymeric matrix being made of a biodegradable biocompatible, water-soluble or water-swellable aldehyde-oxidized polysaccharide. FIG. 11 is a scanning electron microscopy image (×75) of the second opposing surface of a wound dressing of the present invention. In preferred embodiments of the present invention, the absorbable hemostatic fabrics are warp knitted tricot fabrics constructed of bright rayon yarn which is subsequently oxidized to include carboxyl or aldehyde moieties in amounts effective to provide the fabrics with biodegradability and anti-microbial activity. The fabrics are characterized by having a single ply thickness of at least about 0.5 mm, a density of at least about 0.03 g/cm 2, air porosity of less than about 150 cm3/sec/cm2, and liquid absorption capacity of at least about 3 times the dry weight of the fabric and at least about 0.1 g water per cm2 of the fabric. Wound dressings of the present invention are best exemplified in the figures prepared by scanning electron microscope. The samples were prepared by cutting 1-cm 2 sections of the dressings by using a razor. Micrographs of both the first surface and opposing second surface, and cross-sections were prepared and mounted on carbon stubs using carbon paint. The samples were gold-sputtered and examined by scanning electron microscopy (SEM) under high vacuum at 4 KV. FIG. 1 is a cross-section view (75×) of uncoated carboxylic-oxidized regenerated cellulose fibers  12 organized as fiber bundles 14 and knitted into fabric 10 according to preferred embodiments of the invention discussed herein above. One commercial example of such a fabric is Surgicel Nu-Knit® absorbable hemostatic wound dressing. FIG. 2 is a view of a first surface of the fabric of FIG. 1. Individual fibers  12 are shown within a bundle. FIG. 3 is a cross-section view of fabric  20 having first wound-contacting surface 22 and opposing surface 24 and that has been saturated with a solution of polymer and then air dried, i.e. without lyophilization. Individual fibers 23 also are shown. FIG. 4 is a view of surface  22 of fabric 20. As observed therein, in the course of air-drying, polymer 26 agglomerates and adheres to fibers 23, in many instances adhering fibers 23 one to the other and creating large voids 28 in the hemostatic fabric through which body fluids may pass. Polymer 26 dispersed on and through fabric 20 is not in the state of a porous matrix and thus provides no hemostasis in cases of severe bleeding as described herein above due, at least in part, to a lack of sufficient porosity, e.g. surface area, to provide polymer/body fluid interaction effective to provide and maintain hemostasis in cases of severe bleeding. FIG. 5 is a view of opposing surface  24 of fabric 20. As shown, opposing surface 24 contains a larger concentration of polymer coating material as opposed to surface 22 shown in FIG. 4, obscuring most of fibers 23, although the knitting pattern could still be discerned. The coating was thick enough to span across all of the fibers and generate an intact layer 27 of its own, also shown in FIG. 3. This layer appeared to be brittle, as cracks 29 in the coating were observed. The coating layer thickness varied from as thin as about 3 microns in some sections to about 30-65 microns in other sections. In comparing the surface morphologies of surface  22 and opposing surface 24 of fabric 20, it is apparent that surface 22 contained significantly less polymer. The coating was significantly thinner on the fibers than the coating on the opposing surface. While some polymer was observed to span across some fibers, the coating was incomplete or had perforations present. The coating layer thickness, where present, did not exceed about 2 microns. Hemostatic fabrics according to the present invention and comprising aldehyde-oxidized methylcellulose as the polymer matrix are set forth in FIGS. 6-8. As shown in FIGS. 6 and 7, a porous, polymer matrix is distributed on wound-contacting surface  32, opposing surface 34 and throughout fabric 30. Polymer 36 forms a porous matrix integrated with knitted fibers 33. The porous polymer matrix exhibits significant liquid absorption properties from capillary action in the same manner as a sponge. As shown in FIG. 7, the polymer matrix disposed on surface  32 contains countless pores, ranging from about two microns to as large as about 35 microns in diameter or greater. As noted, polymer 36 is present in the form of a porous matrix about fibers 33, thereby providing ample polymer surface area with which body fluids can interact upon contact therewith. Opposing surface 34 shown in FIG. 8 also contains polymer 36 in the form of a porous matrix. As shown in FIG. 9, a porous, polymer matrix is distributed on surfaces  42 and 44 and throughout fabric 40. Polymer 46 forms a porous, polymer matrix integrated with the knitted fibers 43. The porous, polymer matrix exhibits significant liquid absorption properties from capillary action in the same manner as a sponge. As shown in FIGS. 10 and 11, the polymer matrix disposed on relative surfaces  42 and 44 contains countless pores, ranging from about ten microns to as large as about 400 microns in diameter, or greater. FIG. 10 shows surface 42 of fabric 40. As noted, polymer 46 is present in the form of a porous matrix about fibers 43, thereby providing ample polymer surface area with which body fluids can interact upon contact therewith. Opposing surface 44 shown in FIG. 11 also contains polymer 46 in the form of a porous matrix. 1 g samples from Example 3 and 5 were incubated in 100 ml PBS (phosphate buffered saline) buffer (pH 7.2) at 37° C. A piece of Surgicel Nu-Knit® fabric was used in a similar fashion as the control article. After 48-72 hours clear pale yellow fluids were obtained. Size Exclusion Chromatography was performed on the solutions to assess the molecular weight profile. The experiment was performed in duplicate. A TosohBiosep TSK G5000PW×1 SEC column and RI Detector at 40° C. were used with a 0.15M NaNO 3 eluent. Polysaccharide standards were used for calibration. 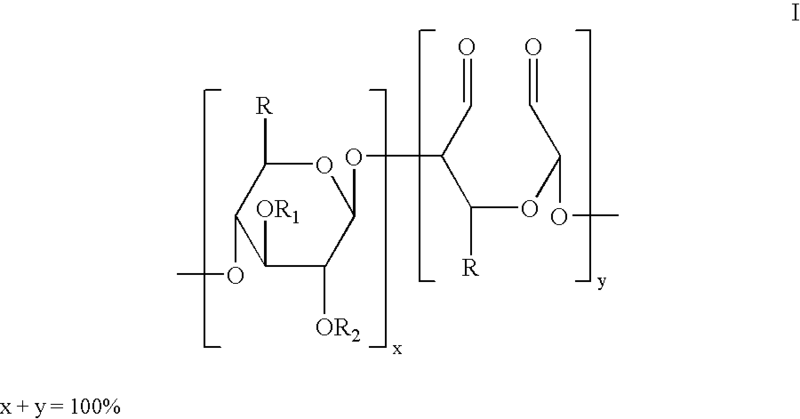 For the series, the solution from Example 3 had higher molecular weight soluble polymers than the solution from Example 5, which had more of higher molecular weight soluble polymers than the solution from the Surgicel Nu-Knit® fabric control. 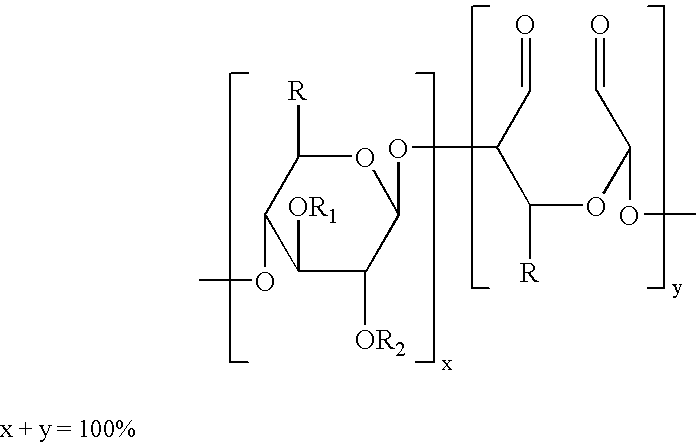 This indicated that there was degradation of material from Example 5 in the buffer. a porous, polymeric matrix distributed at least on said first wound-contacting surface and through said fabric, said porous, polymeric matrix comprising a biocompatible, biodegradable water-soluble or water-swellable aldehyde-oxidized polysaccharide. 2. The wound dressing of claim 1 wherein said fabric is woven or non-woven. 3. The wound dressing of claim 1 wherein said fabric is knitted. 4. The wound dressing of claim 1 wherein said fabric comprise carboxylic-oxidized regenerated cellulose. 5. The wound dressing of claim 1 wherein said aldehyde-oxidized polysaccharide is prepared from a polysaccharide selected from the group consisting of cellulose, chitin, carboxymethyl chitin, hyaluronic acid, salts of hyaluronic acid, alginate, alginic acid, propylene glycol alginate, glycogen, dextran, dextran sulfate, curdlan, pectin, pullulan, xanthan, chondroitin, chondroitin sulfates, carboxymethyl dextran, carboxymethyl chitosan, heparin, heparin sulfate, heparan, heparan sulfate, deimatan sulfate, keratin sulfate, carrageenans, chitosan, starch, amylose, amylopectin, poly-N-glucosamine, polymannuronic acid, polyglucuronic acid, polyguluronic acid and derivatives of the above. 6. The wound dressing of claim 5 wherein said polysaccharide comprises alkyl cellulose, hydroxyalkyl cellulose, alkylhydroxyalkyl cellulose, cellulose sulfate, salts of carboxymethyl cellulose, carboxyniethyl cellulose and carboxyethyl cellulose. where x and y represent mole percent, x plus y equals 100 percent, x is from about 95 to about 5,y is from about 5 to about 95; and R may be CH2OR3, COOR4, sulphonic acid, or phosphonic acid; R may be H, alkyl, aryl, alkoxy or aryloxy, and R1 and R2 may be H, alkyl, aryl, alkoxy, aryloxy, sulphonyl or phosphoryl. 8. The wound dressing of claim 7 wherein said aldehyde-modified polysaccharide is prepared from hydroxyethyl cellulose or ethyl cellulose. 9. The wound dressing of claim 1 wherein the weight ratio of said biodegradable water-soluble or water-swellablealdehyde-modified polysaccharide to said fabric is from about 1:99 to about 20:80. 10. The wound dressing of claim 8 wherein the weight ratio of said aldehye-oxidized polysaccharide to said fabric is from about 3:97 to about 10:90.